People wait to leave Madaya last month. UN CONVOYS DELIVERING aid to thousands of besieged Syrians were due to set out today, but hopes for lasting peace dimmed the day after Turkey called for a ground operation in its war-torn neighbour. 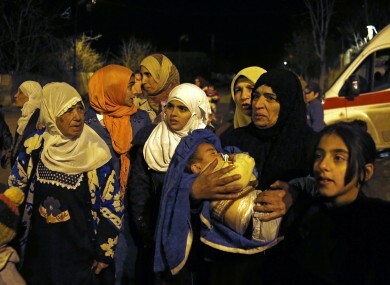 Syria’s government has approved access to seven besieged areas, including the city of Madaya where dozens of people are thought to have died from starvation, a spokeswoman for the UN’s humanitarian affairs office said. Speaking in Damascus, UN envoy Staffan de Mistura said aid convoys will be sent today in what will be a test of whether the warring parties will allow in humanitarian supplies. “It is the duty of the government of Syria to want to reach every Syrian person wherever they are and allow the UN to bring humanitarian aid,” he said after meeting Syria’s Foreign Minister Walid Muallem. “Tomorrow we test this,” he said last night. Almost half a million people in Syria are in areas under siege, according to the UN, after almost five years of civil war between Syria’s government and rebel forces. A Red Crescent source said the first convoys will head for the rebel-besieged Shiite villages of Fuaa and Kafraya in the north, and to Madaya and Zabadani, which are encircled by the army. Allowing in humanitarian aid was an important element in negotiations to clinch a ceasefire across war-torn Syria, but both sides have cast doubt on whether it will be implemented. Seventeen world powers agreed to a nationwide “cessation of hostilities” across Syria within a week under a deal struck in Munich last Thursday to end a war that has killed more than 260,000 people. But the bombings of at least five medical facilities and two schools in northern Syria, which the UN said on Monday killed 50 people including children, have dimmed hopes for a ceasefire. Under the deal, a new round of peace talks will be held in Geneva on 25 February. Email “Aid will finally reach 500,000 besieged Syrians today but peace is a long way off”. Feedback on “Aid will finally reach 500,000 besieged Syrians today but peace is a long way off”.